Most of Wall’s street pictures are based on everyday situations that he has witnessed at first hand. He is particularly interested in what he calls ‘micro-gestures’: gestures that seem automatic or compulsive, and which are at the same time emblematic of tensions within society. The large colour-print format that Wall favours requires a camera that is ill-suited to capturing fleeting moments, yet he wanted to explore the documentary style of street photography practiced by a number of photographers, such as Robert Frank or Garry Winogrand. Wall’s solution was to restage such moments, preserving a sense of immediacy by using non-professional actors in real settings. He calls these constructed images ‘cinematographic photographs’. 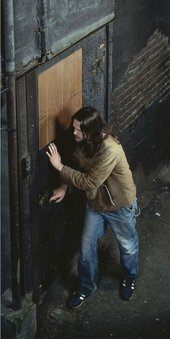 In Mimic, the white man’s ‘slant-eyes’ gesture recreates a scene of racial abuse that Wall witnessed on a Vancouver street. Milk is another depiction of a socially charged subject. ‘Suffering and dispossession remain at the centre of social experience’, Wall has commented. The explosive burst of liquid is emblematic of the man’s state of mind, but what might have provoked such extreme emotion is not revealed, a state of ambiguity that ensures the work cannot be understood as moral commentary. The process of reconstructing an event allows Wall the freedom to reinvent the composition. He often relocates the action to a different setting, a place chosen for its formal or pictorial qualities, as is the case here. The grid-like order of the brick wall background, and strong vertical bands that stripe the left side of the image contrast sharply with the tension in the man’s arms and the uncontrolled arc of milk.